Task Force 65/Destroyer Squadron 60 located in Naples, Italy. Commander, Task Force 65/Commander Destroyer Squadron SIX ZERO exercises operational and tactical control of all forward deployed surface combatants operating in the USEUCOM and USAFRICOM AORs under the direction of Naval Forces Europe/Africa. TF 65 surface combatants execute myriad operations from as far North as the Norwegian Sea and south to the Cape of Good Hope including Ballisitic Missile Defense, Sea Lines of Communication enforcement, Maritime Interdiction Operations, direct support to NATO combined and Joint operations and exercises, Counter-terrorism operations, Counter-piracy operations, Africa Maritime Law Enforcement Partnership operations, whole of government Africa Partnership Station deployments and Theater Security Cooperation activities both inport and underway. 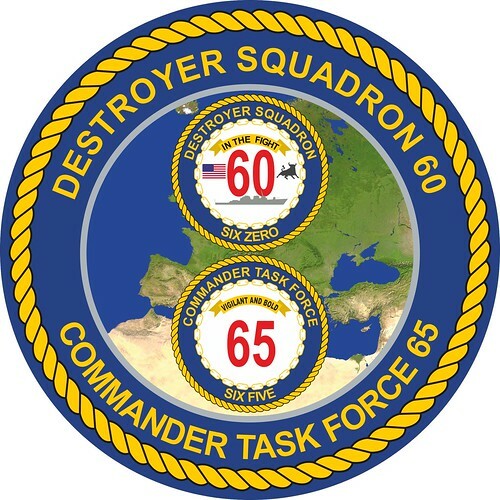 It can be seen from this 2011 official description that the CDS 60 task force designator has been switched from TF 60 to TF 65. In November 2007, the destroyer Forrest Sherman circumnavigated the African continent while performing theater security operations with local military forces as the flagship of Task Group 60.5, the U.S. Navy’s Southeast Africa task force.